Earlier this week I took advantage of the San Diego museum program called “Free Tuesdays” by taking my three year old for a surprise visit to the San Diego Model Railroad Museum right after his morning preschool. We didn’t have much time since we had to drive 25 minutes to San Diego Balboa Park, park really, really far away from the museum, enjoy the show, drive back and be back at school by 2pm to pick up my five year old. I still managed to see quite a lot of cows during our short visit. 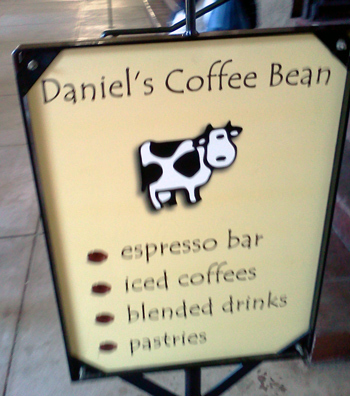 I found the first one on a sign for a coffee shop. I apologize for the blurry photo. This is what happens when you try to snap a picture with a squirmy, excited three year old hanging on to your other hand. If you want to see a clear picture of this sign I took one in 2011 (click here). I just remembered this is a cyclop cow (I can’t believe it didn’t make it to my Top 10 Best Cows of 2011). 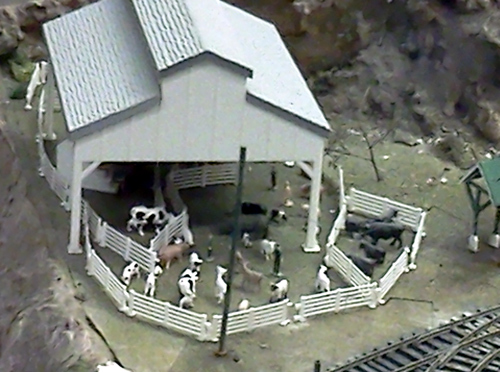 When we entered the San Diego Model Railroad Museum, my son wasn’t quite sure what to expect. As soon as he spotted his first moving trains through one of the display windows, he refused to go any further. It took a lot of convincing for him to understand there were many more trains to see. Even the retired volunteers (should I say they’re all men?) know the best company for trains is cows. And not just one, but a whole herd. Wow cow! Stood a cow on a railroad track. Sorry. It popped into my head and right out onto the page. Beautiful poem, thanks for sharing! It reminds of a Thomas the train book we have at home, with quite a boring story (whiny Thomas) and awful artwork. Just take a look, it’s pretty disturbing.